Here are the details of Top 7 Summer Programs in India and abroad curated by Univariety . CLICK HERE to know more about the Summer Programs in detail from the advisors of Univariety. Summers are a time to learn and enjoy at one’s own pace. It is an opportunity to unwind and have fun, make friends and a unique opportunity to learn new things. Some students choose to use this time as a unique opportunity to learn new things and attend a summer learning school. Some students go to summer schools to practice their language skills, some want to learn more about subjects they are interested in, and others want to test how they like a completely new field of interest. Universities often provide different summer course options so that everyone can pick something that will make their summer unforgettable. A summer school provides a focused academic environment with smaller classes and fewer learning hours. Because the duration of the study is limited, teachers usually set very precise study goals. Students find themselves immersed in a subject and gain a solid grounding in the subject matter. A welcoming and highly interactive study environment typical for a summer school is the perfect setting for making a lot of new friends. Innovative class activities are great social icebreakers in addition to other great opportunities to interact with like-minded bright students. The number of summer schools offered by top universities around the world is growing at a rapid rate, each of them providing a diverse range of courses. A summer school is a form of education provided by universities and international colleges during the summer vacation, with courses usually lasting one to eight weeks. Students engage in full-time intensive classes related to a chosen subject and have the option to attend extracurricular activities designed to encourage socialization and stimulate cultural awareness. Summer schools offer courses that may aid students in revising a subject studied during the previous academic year, further exploring a known subject, or discovering a new interest. PENN SUMMER PROGRAMS provides a complete Penn experience whether you study on-campus, online or in an international locale. The online courses are taught live, in order to connect with the professors and participate alongside peers in real time. 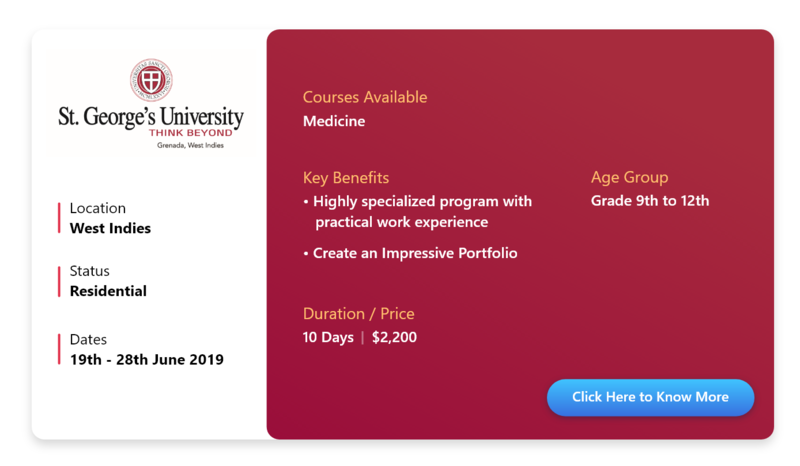 To know more in order to enroll with Penn during the summer to accelerate academic or professional goals, kindly log in to https://www.sas.upenn.edu/summer/programs/international for more details. Experience the challenge of college study with CORNELL UNIVERSITY, earning credits and prepping for college admissions with more than 40 intensive precollege summer programs available. The Cornell University SCE precollege studies program invites International students to apply for Summer On campus Program or a Cornell Course Online during the summer/ winter session. Kindly log in to https://sce.cornell.edu/precollege for more details. The HARVARD SUMMER SCHOOL PROGRAM invites International students to apply for Pre-College Program – a two-week residential experience featuring noncredit courses or a Secondary School Program – College courses for credit in a seven-week session. Kindly log in to https://www.summer.harvard.edu/high-school-programs/secondary-school-program for more details. OXFORD SUMMER SCHOOL provides students from all over the world to enjoy the true Oxford experience with enriching academic courses and cultural adventures. Summer courses are available in a variety of arts and STEM subject areas, including Medicine, Architecture, Law and Computer Science. In 2019, Oxford Royale Summer Schools will be running Summer School programs in the UK’s top three universities – the Universities of Oxford and Cambridge and Imperial College London – as well as prestigious academic centers in England and Scotland. 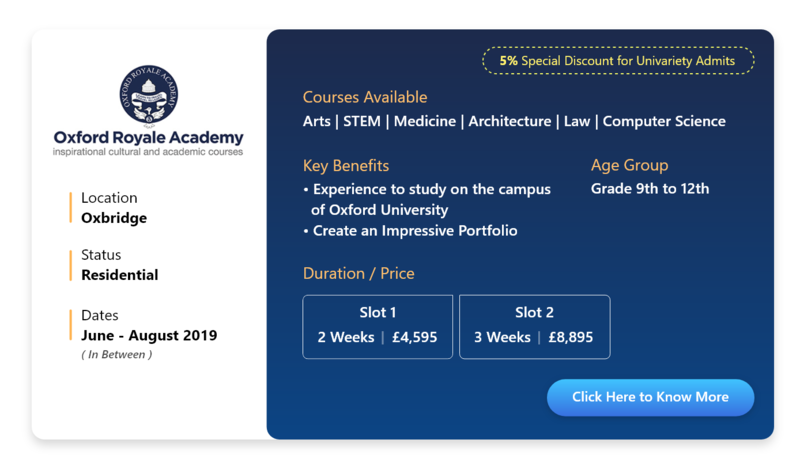 Kindly log in to https://www.oxford-royale.co.uk/summer-schools or https://oxfordsummercourses.com for more details. YALE CENTRE FOR PROFESSIONAL EXPERIENCE organizes Yale Summer Sessions as a University preparation for International High School Students. 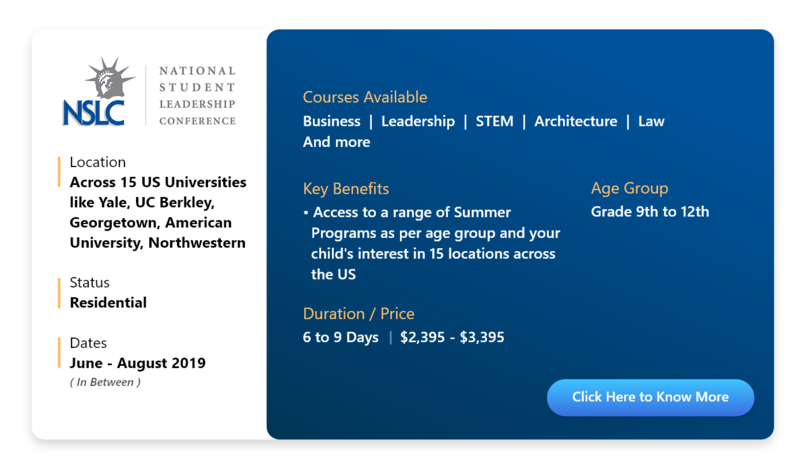 The three-week program at the Yale University is designed for international high school students with strong English skills who want to prepare for undergraduate study at an American university. To know more, kindly log on to https://summer.yale.edu/academics/university-preparation-international. This is just a small snapshot of the various summer learning camps that are available across the globe. We urge you to explore various options that are available keeping your child’s interest, academic and personal goals in mind. Few more summer learning camps have been updated on http://rohini.ths.ac.in/career-guidance/ and further list will be added from time to time. Kindly refer to the same for more details. The sanction of leaves and pre-requisites (Letter of Recommendation, Bonafide letter, Transcript etc.) required for the application process from the School needs to be applied for and approved by the Principal. Students of Grades XI and XII (of academic year 2019-2020) would only be permitted to attend Summer School during the school working days provided they fulfill the below mentioned requisites of the School. Hoping that the summer vacations are enriched with wonderful interactions, qualitative discussions, celebrations, insights, learning experiences and happiness, please do plan to get the utmost during these upcoming summer vacations. 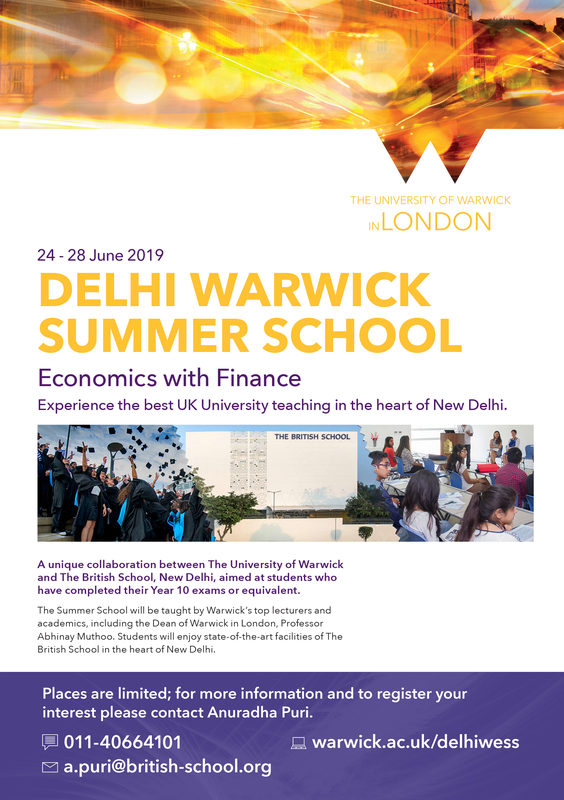 For the 5th year running, The British School and Warwick University have joined forces to run the prestigious University of Warwick Summer School offering a five-day course in Economics with Finance. 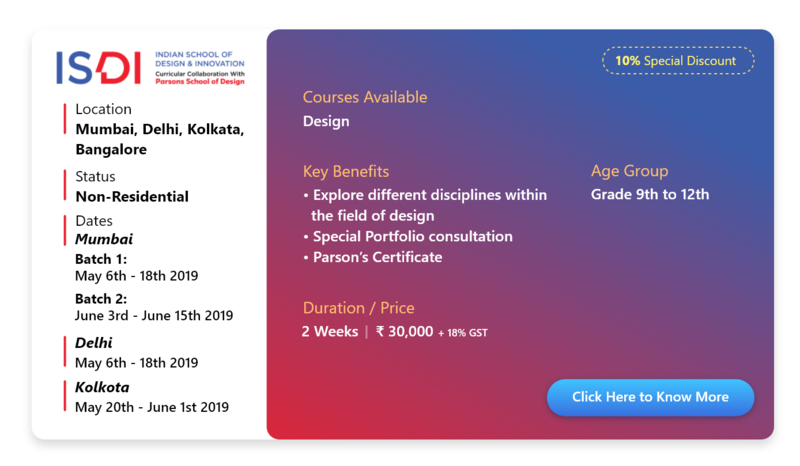 The Summer School is aimed at students who are entering Year 12 and 13 (British system) or Class 11 and 12 (Indian system) or who have completed their IGCSE, CBSE, ICSE or other Year 10 examinations. 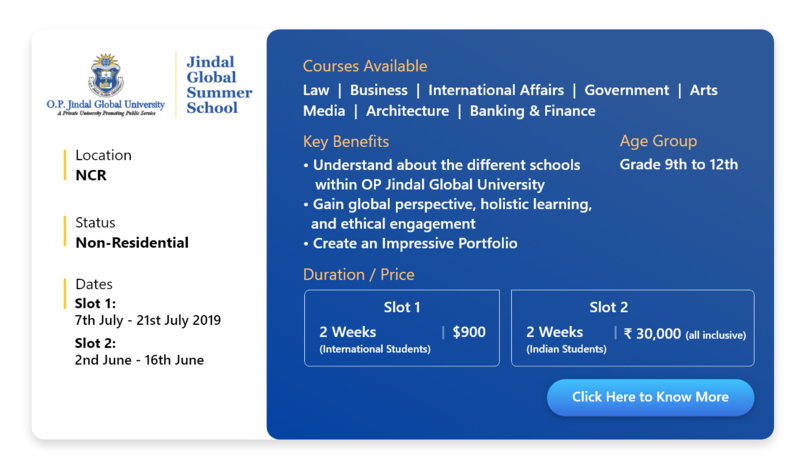 The Summer School will be hosted at The British School, New Delhi from Monday 24 – Friday 28 June 2019 (inclusive). It will be taught by top lecturers from Warwick University providing students with a unique insight into what it would be like to study economics or finance at degree level in the UK. In addition to the academic lectures and seminars, the Summer School will also include personal development sessions and a gala reception and awards ceremony for students and their parents (dinner will be over by around 8.30 pm on 29 June – outstation students should plan their departure accordingly). Warwick University is one of the UK’s leading Higher Education institutions. Warwick Economics is rated in the top three in The Times and Sunday Times league table 2016 and in The Complete University Guide’s subject league table for Economics for 2017. Professor of economics and the former Head of the Department of Economics at the University of Warwick, Dean of Warwick in London and Director of the Warwick Policy Lab, Prof Abhinay Muthoo’s research interests include conflict and negotiation, international development and public policy. Abhinay will be supported by Siobhan Benita, who will deliver the Personal Development and Soft Skills sessions. Siobhan is the Chief Strategy Officer of Warwick in London (WiL) and Co-Director of the Warwick Policy Lab at the University of Warwick. Before starting her current role, she was the Chief Policy and Strategy Officer of the Department of Economics at the University of Warwick. For more information, including details on how to register, kindly log on to http://www.warwick.ac.uk/delhiwess or contact Anuradha Puri at a.puri@british-school.org or 011-40664166. The commencement of AMITY’s 13th Batch of Summer School Program would take place from 27th May to 7th June 2019. The 2 week University Level Certificate Program is offered to students of class 12th & 12th Passing out ( 2019-2020), who are in the dilemma to decide which field of higher education they should pursue or want to be sure about the decision taken by them or to get an advantage over others by experiencing the University Life, even before they join University. The best way to learn about Hospitality is by doing it. Our Summer Programs introduce students to different areas of Hospitality and students from across the Globe participate every year. They are both experiential and theoretical, so students can see if a career in this dynamic, opportunity-rich sector is for them. Les Roches & Glion offer One & Two-Weeks programs spread across different campuses in Switzerland, Spain, London & China. 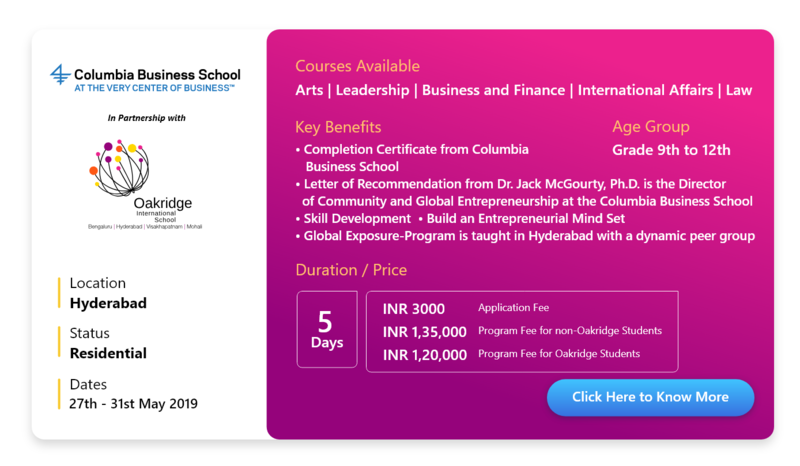 Summer Experience Scholarship: For Students who attend the Summer Program and subsequently enroll for a BBA (UG) program, the summer tuition fee is deducted from the BBA Tuition fee in Sem 1* T&C apply. To know more about the programs and information on the applications do not hesitate to contact me on the below mentioned details. We look forward in welcoming students from your school. Before you launch into the new term, we are gearing up to provide a space to delve further into the understanding of various spaces and SELF. Towards this process and based on the over whelming response over the last 5 years, we once again bring to you the ITIHAAS Summer Heritage Programme who want a new learning experience in the summer vacations. Many parents and schools have requested us for early information regarding the dates for 2019. The details of the programmes are attached to this mail along with an application form. We have a total of 380 seats across all projects and every year we receive over 3500 applications. This year we have opened the project experience to students from outside Delhi as well. Through this decision, we hope to also give students the opportunity to treat the project as a space for exchange based learning, by interacting with young people their age from other cities. As this is a project- based programme. ITIHAAS will be collecting a contribution from all students to cover organizational costs for the programme & material costs. The contribution is Rs. 2500/- per programme. Please note that contributions are not refundable. As pointed out by some schools that students of Classes X and XII may have extra classes in May, we have thus opened the Summer Programme in the first week of June as well. For other information please do call us @ 24310547 / 41513763. Please find the attached application form & programme details. 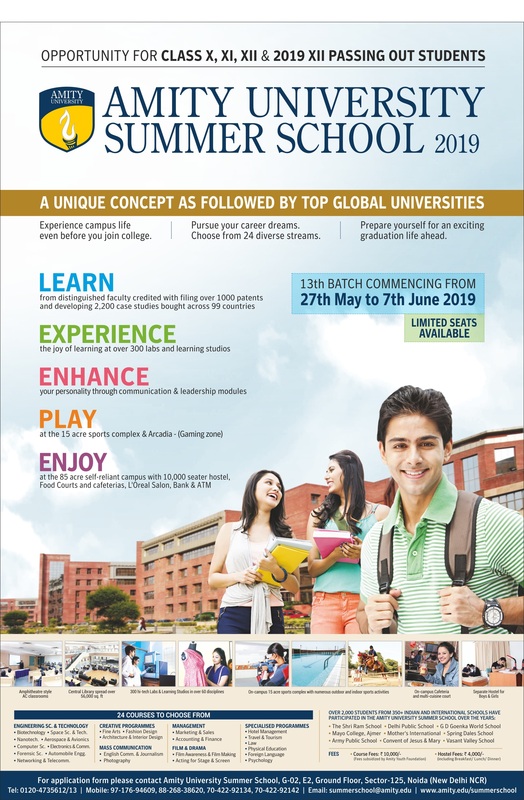 The 13th Batch of Amity University Summer School Program is commencing from 27th May to 7th June 2019 at Amity University, Noida Campus (Delhi NCR). It is an opportunity for school students of Grades X to XII to choose a University course, receive in-depth knowledge on it along with holistic exposure on variety of higher education streams and experience college life by being in campus for two weeks. This innovative concept enables students to practically examine career options available and choose the right domain for Graduation which suits their interest-ability-scope and gives rationality to their decision. This program adds transformational high value to students both academically and socially, paving the way for a successful college experience. 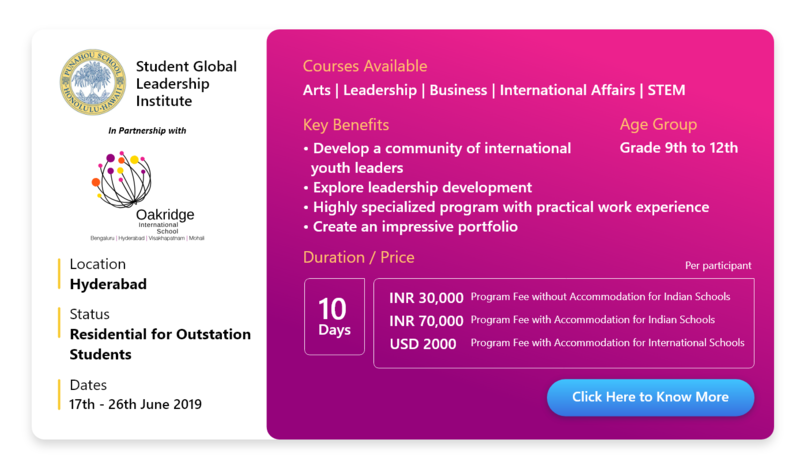 To know more about this program do visit www.amity.edu/summerschool or join the Official Amity University Summer School Facebook Page Click Here. Please find below the December webinar calendar. The recordings can also be viewed at a later date by class XI and XII students by logging onto UNIVARIETY through their login ID.